Most commercial cleaning prospects don’t want a commercial carpet analysis. They just want (wait for it! )… a price! You, on the other hand, should morph into a “consultant”! How can you gain your prospect’s respect? (And business?) By helping them design the cleaning specifications! 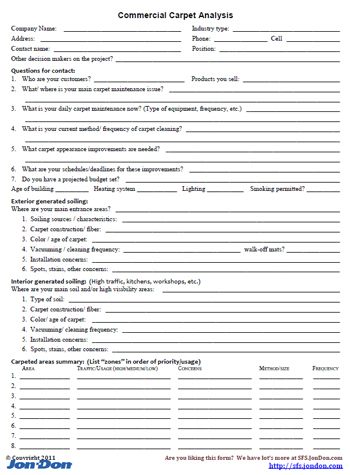 Use this Commercial Carpet Analysis (CCA) form to “structure” this very important Initial Interview. NOTE: To use this CCA form you need to “git yerself out there”. HERE is my free “How to Sell Commercial Cleaning” manual. Remember- the longer you keep your prospect involved in the interview process the more likely they will want a “Return on their Time Invested”. The only way to do this? Go with one of the (at least) three options offered in your proposed Service Agreement! HERE is your free CCA form download! Let me know how it works for you! Steve, could you e-mail me the Commercial Carpet Analysis form. For some reason I was unable to donload it. I sent it as an attached file to the email on your website, Danny. Email me personally at stevet@jondon.com if you don’t get it. Good evening I will like to received more information on getting commercial cleaning contracts.